An alcoholic detective conducts her own investigation when a figure from her past re-emerges. Having reinvented herself with the low budget, confined thriller The Invitation, director Karyn Kusama finds herself back in the mainstream fold, having been cast out off the back of dual flops Æon Flux and Jennifer's Body. Now with the clout to cast no less a star than Nicole Kidman, Kusama delivers a female take on the played out detective thriller format, but as we've seen with other recent films, simply gender swapping tired old concepts doesn't make them any fresher. Kidman's LAPD detective Erin Bell is as clichéd a cop movie archetype as any you might find in the '70s and '80s heydays of the genre. She's an alcoholic who makes her own rules, with a troubled past and, of course, a failed marriage. Resembling the 'after' photo on a before-and-after poster warning of the effects of Meth addiction, Bell arrives at a murder scene one morning, seemingly drunk, and barges her way in to check the cadaver. She's startled by an ominous clue left on the body - a dollar bill stained from an exploded dye bag. This causes Erin to replay her first ever undercover case, which ended disastrously. 17 years ago Erin and fellow cop Chris (Sebastian Stan) infiltrated a gang of armed robbers led by the maniacal Silas (Toby Kebbell), who she believes has returned to Los Angeles. One by one, Erin tracks down the surviving members of the gang in a quest to confront Silas and banish her past demons. Kidman delivers two distinct performances here as both the grizzled present day Erin and the naive young woman we see in the flashbacks. Much attention has been given to the actress's physical appearance as the former, but frankly I found the make-up and prosthetic job distractingly over the top. Would someone in such a state really be allowed keep their job with the LAPD? I guess they did in trashy '80s action movies, but Kusama's film is far too serious in its tone to allow us to overlook such inconsistencies. More impressive is Kidman's turn as her character's younger self, the 50-year-old star remarkably convincing as a wet behind the ears twentysomething, but we witness far too little of this period. The story of how Erin and Chris become seduced by the lifestyle offered by Silas is more intriguing than the by the numbers detective thriller that constitutes the present day timeline. 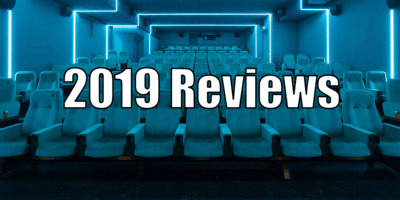 Without enough depth afforded to either timeline, the effect is of two more interesting movies that have been chopped up and cut together, leaving most of the meaty scenes on the cutting room floor. Without Kidman's presence I suspect Destroyer would be headed straight for DVD, as on the surface there isn't much to distinguish it from its b-grade crime thriller contemporaries. It's a shame that her scriptwriters - Phil Hay and Matt Manfredi - fail to construct a more involving and original story, as Kusama shows off her directing chops in a couple of standout sequences. A shootout during a bank heist and its resulting pursuit evokes the '90s movies of Katheryn Bigelow with its L.A. street action. 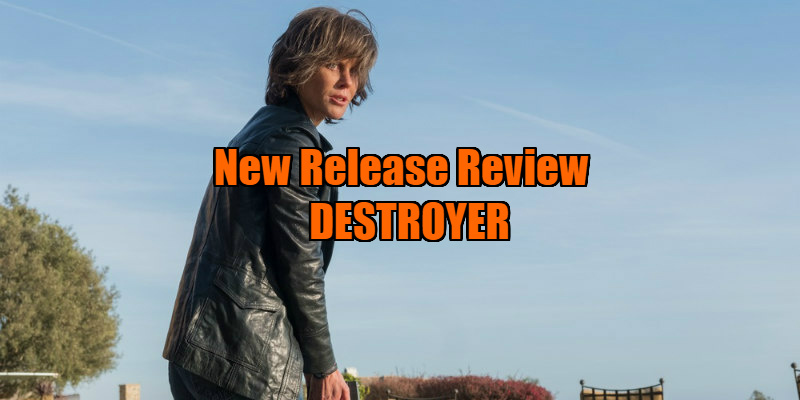 Both in theme and aesthetic, Destroyer plays like a mash-up of Bigelow's cop thrillers Point Break and Blue Steel, but it only momentarily captures the surface thrills of either. 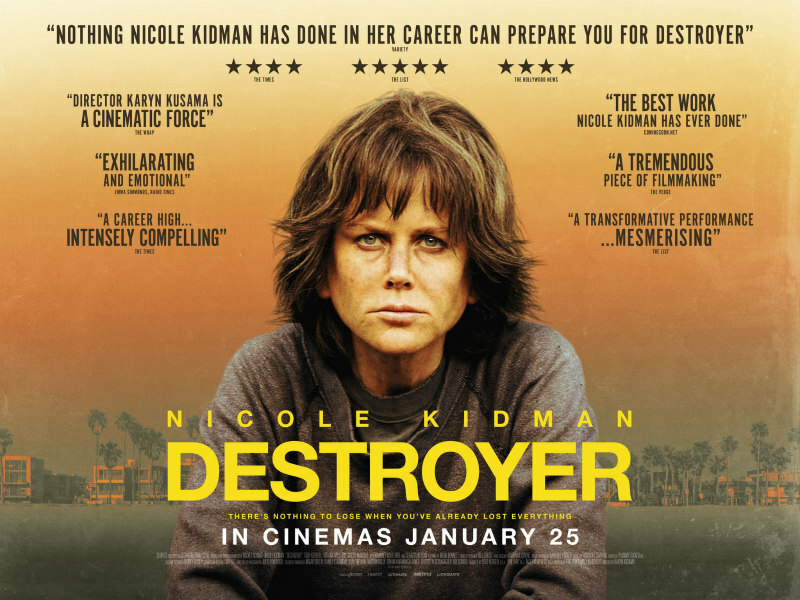 Destroyer is in UK/ROI cinemas January 25th.